The trail hunting Distianert DH-8 camera – a scouting camera with accurate field intelligence. This camera is waterproof (IP56) and is perfectly designed for outdoors survival. The battery life can shoot up to 30, 000 images that the power saver system helped to boost. You may install power saver anywhere and let this camera entirely work for you. The camera is powered by 4 or 8xAA batteries that are also dependent upon the frequency of your usage. Shoot and play with a consisted built-in screen display that allows you to play recorded videos directly. That means removing the SD cards to transfer file for data checking and previews is unnecessary. You can also check and review images on the spot, right into the woods, without any connection to the desktop computer. This trail camera’s low glow black LED illuminators, in night version, do not interfere with wildlife. The multi-shot mode is up to 3 photos per detection. The HD video recording is from 1 to 60 seconds. You can even take pictures at pre-set intervals under field scan time-lapse mode. The interface comprises TV-out port, USB port, Micro SD card slot, and 6V DC external. Never miss anything with the trail hunting Distianert DH-8 camera’s features including the super-fast trigger speed that is 0.6 sec (pre-boot 0.2 sec). This would mean that there will be no delay between triggers when it takes and captures still images, also ensuring a perfect shot without missing anything very important in the hunting area or anywhere. Never let the chances go in taking the breathtaking and impressive moments with the multi-shot feature that can take up to 3 pictures in every shot. The device supports a 32GB of SD card, and you will be able you to store a bunch of photos and videos. You can then transfer the files easily to any media enabled devices. The camera is equipped with the newest type of detection sensors – 125 degrees and 80 feet wide detection range. The trail hunting Distianert DH-8 camera is capable of covering a larger area with reduced time delay. Through the camera’s low-glow black covert 42 LED lights which serves as the light of the camera at night, the camera can produce a 65 feet flash range in the dark. The flash technology is a long-range infrared (850 nm). The flash does not intrude into the natural habitat, and it does not cause any bothersome to the wildlife. The camera has a combination of camera and video mode feature. That feature produces 12MP images and 1080P videos that are accompanied by sound. Distianert also features the high-quality day and night capture that takes 12 MP crystal-clear colorful images with alive colors by day. Separately at night, the camera captures clear black and white photos. The provision of 1080P HD video recording with sound is also given. The quality pictures and videos are obtained with the help of responsive and sensitive IR sensors for accuracy and audio clarity. Other than that, Distianert brags about its user-friendly setup. The 2.4 inches LCD screen display will provide an easy way to set up and preview the settings stored on your device. For entry-level users, whether used on trails or nest sites, the built-in presetting is ideal for the most of wildlife applications. While for advanced users, with the 2.4 inches LCD screen, it is at ease to personalize the settings, as well as replays. Include the incredible durability of the camera. The gadget’s case is flawless with big, sturdy, and easy-operated latch. For mounting the camera on a tripod, there is a threaded insert on the bottom of the camera. The back bracket fits a strap as well. Distianert is pretty rugged, waterproof (IP56) and can be left for long periods outdoors. The device has provided a quick start system function suitable and is the best option for learners and beginners. It has provisions for a speedy pre-set setup of modes and features. For the multifunctional controls of the camera, you can make use of the time-lapse, interval trigger, multi-shot, record timing, password protection, time stamp, serial number, plus additional photos or videos modes of settings. These will all provide the users with a customizable device that will meet their needs and demands. This cool gadget is not large. It is a little smaller than a dollar bill. The latches on the side open and close securely. On the bottom of the unit is a 6 volt 1.5 amp power inlet. If powered by a car battery and using a voltage regulator and a solar cell to charge the battery, you could virtually run this camera for years without it dying on you. The unit itself is made out of a tough grade of plastic with an inner rubber seal that will keep the moisture out. There is also a 2.4 inches TFT monitor and a speaker inside the case so that you can monitor what you have recorded. It will capture footage in daylight or total darkness. It can shoot stills in either 16, 12, 8, 5 or 3 megapixels with its 8 Megapixel CMOS sensor. Distianert has an IR flash that is good at about 40 feet for capturing stills with a triggering distance of 50 feet. A good thing about the Trail hunting Camera Distianert DH-8 camera is that it can be used for security. The camera triggers silently when it detects any person walking in front of it. And, it will take a series of pictures of that person, so you will know who is sneaking around. If someone has been breaking into your cars at night, this camera might also be helpful. You just need to mount and position it somewhere inconspicuous. You might like the optional security password. The security feature which when set requires a 5 digit code be entered. To unlock the camera when you want to look at the pics or use it, you need to input the password. At least if someone steals it, they won’t be able to use it themselves. It also has an option that you can put a small lock to keep a random passer-by from stealing the SD card. Other than that, it has a place to run a cable lock through. It takes up to 8 AA batteries so that you would not need to swap batteries as often as some other cameras. The box is capable of running 8 months on 8 AA batteries, but that is contingent on how long your clips run. It also depends on how often the camera is tripped. Something peculiar about this camera that you cannot see in many other cameras is the sensors on each side. This might be good for a game camera since this is the timeliest matter when taking pictures. The sensors on the side detect movement and “wake” the camera before a game enter the picture. It is also sensitive enough even to pick up field mice. The camouflage print on it is outstanding quality and blends well with the environment. This comes with a couple mounting options like a wall/ screw mount which comes with the screws. The alternative option is the strap that comes with it to wrap around the tree. Another feature that you can use and might be helpful is the tripod mount hardware that is included. Also, the LCD screen allows users to see where the camera is pointed and you can review pictures or videos on the spot. It has easy to follow program menu. The pictures are of high quality at the day as well as the videos. The videos are of excellent audio quality. The camera provides an excellent option of Hybrid Mode if you can’t decide on pictures or video. Hybrid mode is video plus photographs. The temperature and moon phase is a bonus feature. Video mode is 1 to 60-second settings or, 3, 5, and 10 minutes. Photo bursts from 1 to 3 pictures at a time. The gadget is silent enough when it takes pictures. It will not alert anything you are trying to capture. The motion sensor is rapid and has an excellent range. The trigger is also fast, but you can change the speed as well. You will hardly miss anything from this camera. You might also take fewer blurry pictures of moving objects and might not take a ton of false triggers than many other cameras. The cam works as expected and even if it is dropped on the concrete, it still appears to be working well even after the impact. It also seems to be working well in freezers down to -20 degrees Celsius or -2 degrees Fahrenheit. Battery life appears to be good even under these icy conditions. This camera might be unreliable. It might quit taking night photos after a couple of months. There are some cases that the camera does not record and capture moments. You might often see a deer crossing in front of the camera, and just nothing happens. It also appears that this camera is only working quite well with larger animals. You might experience it does not detect smaller animals, might even your 15 lb dog with the highest sensitivity setting. Other than that, you might also experience the camera won’t display the screen but seems to be continuing to take pictures. You might try new batteries and a new card, but it just might be stuck in an endless reboot cycle. This just might not be right mainly when you are in the woods or anywhere you are planning to mount this camera. It does not seem right to check your camera at a time you are also hunting. You don’t want this playing music for every animal within 200 yards to hear. The field of view might be too wide, and everything might seem to be too far away. You may not notice that it has a micro SD card, and not only it’s a micro SD, but it’s located on the bottom of the camera. So if you drop it on the ground in the dirt, you might not be able to find it anymore. Another thing is that the primary motion sensor protective cover does not have such a tab. And it may not come unstuck with your fingernail. And if you put too much pressure on the sensor, you might damage it. Also, the illumination of LEDs might be very bright at night. It might not be stealthy at all. Additionally, you might experience a problem that is preventing you from testing the camera. All the other plastic protective covers had a little plastic tab to one side, to make for easy removal. The protective cover over the main motion sensor is stuck solidly to the sensor lens, and you can’t seem to peel it lose, no matter how you try. The product might also be a very shady looking and has a difficult to use product registration system. Lastly, you may leave it out for three weeks, and when you get to view pictures, you might discover that there is moisture inside and a window will be fogged up. The camera might take pictures but will die because of the moisture inside. You may check the seal around the cover and could not find any damage. And then you could not tell if it was leaking around the glass. This camera is excellent for camping, hunting, and animal or event observation. It is best for Motion-Triggered Security for home, office or community, or anyplace where you need indoor or outdoor surveillance where invasion evidence is necessary. 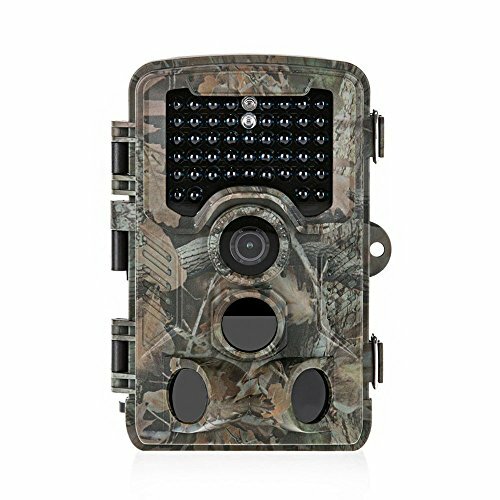 Also, if you do not intend to leave this trail camera for weeks in the woods and get it out from a big possibility of damage, then this product is perfect for you.